Macular degeneration is the deterioration of the central area of the retina called the macula. 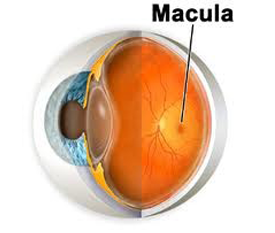 The macula is very small, accounting for only 5% of the surface area of the retina. Due to the macula’s special construction it makes fine, detailed vision possible, such as seeing features on faces, reading fine print, or seeing street signs while driving. The remainder of the retina provides us with our less detailed peripheral vision. In macular degeneration damage or breakdown of the macula occurs. The symptoms are distortion or blurriness of detailed vision (central vision). The most common type of macular degeneration is the "dry" or atrophic form. In this form, there is damage to the pigment layer under the retina. Because the pigment layer provides nutrition and protection to the retina, when it is damaged, the retina doesn't function properly. The "dry" form of the disease tends to progress slowly, and cause less severe vision loss. All macular degeneration starts out as the "dry" type. In 10-15% of cases it progresses to the more aggressive "wet" or exudative type. Abnormal blood vessels form under the macula, which leak fluid or blood. Vision loss from the "wet" type tends to be more rapid and severe than the "dry" type. Macular degeneration almost always involves both eyes, but one eye is often many years ahead of the other in the deterioration process. It is possible to have one eye with the "dry" type and one eye with the "wet" type. Despite the fact that age related macular degeneration (AMD) is one of the major causes of decreased vision, scientists are not able to determine what causes this change in the macula. In most cases of AMD, people are affected at the ages of 60 - 65; however there have been cases where people have been diagnosed at ages range from 40's to 50's. AMD has also been found to be a hereditary disease, which may provide an increased risk to people who are related to someone with AMD. It is not known what else causes it. Most people who develop AMD have the "dry" type; this is a very slow working process. In this condition, yellowish deposits called drusen accumulate beneath a part of the eye known as the retina and cause it to lose some of its function. Because the central part of the retina, known as the macula, is most affected, this process is called macular degeneration. The layer of light sensitive cells also gets thinner, which tends to causes the vision to get distorted or blurred when reading. When the disease strikes one eye there is an increased risk that the other eye will also become affected. People with the "dry" AMD rarely become totally blind. The real problem occurs when the "wet" type develops, which is also called neovascular form. This form is caused by new blood vessels when they begin to grow under the macular. When these blood vessels leek, nearby cells weaken and die. This can make straight lines look curved and result in blank spots within the vision field. If the leaking continues, it will destroy most of the nerve tissue within weeks to months. Today, this damage cannot be repaired by modern medicine. The neovascular “wet” form only strikes a small percentage of AMD patients. When macular degeneration is found in juvenile individuals (age range from 7 years to early teens), the condition is called Stargardt’s disease, and is similar to the “dry” form of macular degeneration. When you suffer from macular degeneration there are some things you as a macular degeneration patient can do yourself to slow down the progression of the disease. When you combine positive lifestyle changes and provide your body with necessary vitamins and minerals, you will "see" the difference. 4. Make it a habit to exercise at least 30 minutes every day, drink at least 64 ounces of water a day, and try to be lean with the salt throughout your meals. Macular degeneration starts with plaque buildup in the arteries, so protect your eyes the same way you would protect your heart. 5. To monitor the development of macular degeneration, you can get vision field scans, this will map the area and severity of the damage you have. You can have an amsler grid test to check for changes within the eye from "dry" to "wet" macular degeneration. You can also have a near visual acuity card test to check your vision in reading distance (18”) on a regular basis. You still have to keep up with your regular appointments with your ophthalmologist. For more detailed information about the nutrition for macular degeneration, see our Macular Degeneration Nutrition page.